One of the great parts of writing this letter is the people I get to meet. Among those I enjoy hearing from is former NYSE floor trader, Clay Tompkins. His years spent on a trading floor gives Clay a certain insight about markets that is tough to describe. It involves a willingness to fade consensus accompanied with a healthy respect for the power (madness?) of the crowd. Clay sends me tidbits from time to time, with a few wise words that always seem to resonate with me. In the heat of the summer, he started sending warnings about Apple. Kev, There’s an interesting piece on Novo Nordisk in the WSJ today, about how they improved their insulin and raised prices accordingly, with the result that customers opted for the older, cheaper formulation. Apple is doing the same, and I think the results will be the same. My daughters scoff at the idea that they or their friends would seriously pay $1100-1400 for the new phone. Andy Kessler called this the “ radial tire” problem, whereby radials, getting 50,000 between replacement killed the bias ply model which needed changing every 12,000. Buffett and Tepper and all the rest are too rich to get it. I know your site says “ macro”, but at 3.6% of the S&P, a falling Apple will have real repercussions. Well, Clay was almost spot on, only missing the fact that Apple longs had just one more week of gains ahead of them! As soon as September hit, the pink tickets came out for Apple. Today, most know the bearish Apple story. 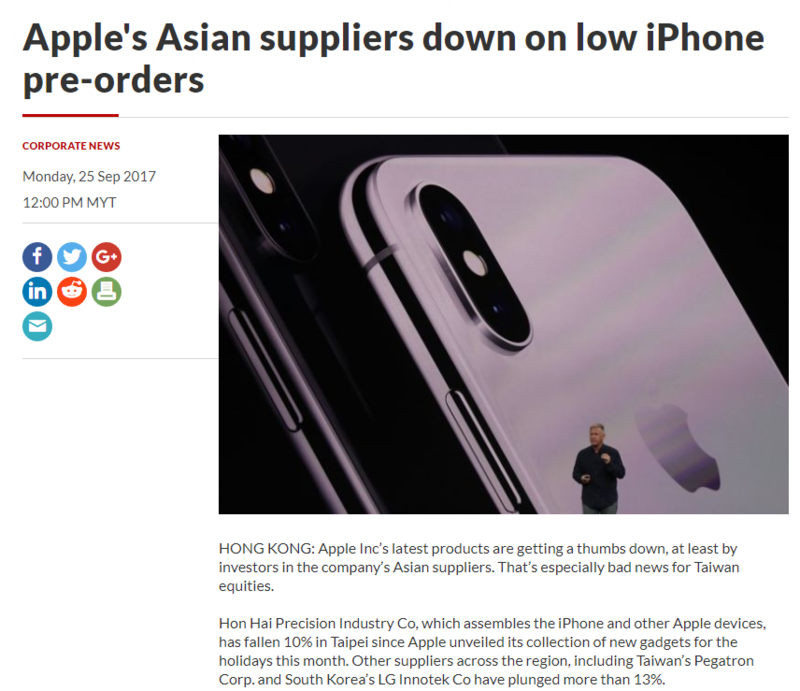 A disappointing new iPhone announcement, with few new must-have features, has resulted in the lowest pre-orders Apple has seen in quite some time. Clay is on to something, and as usual, way ahead of the curve. 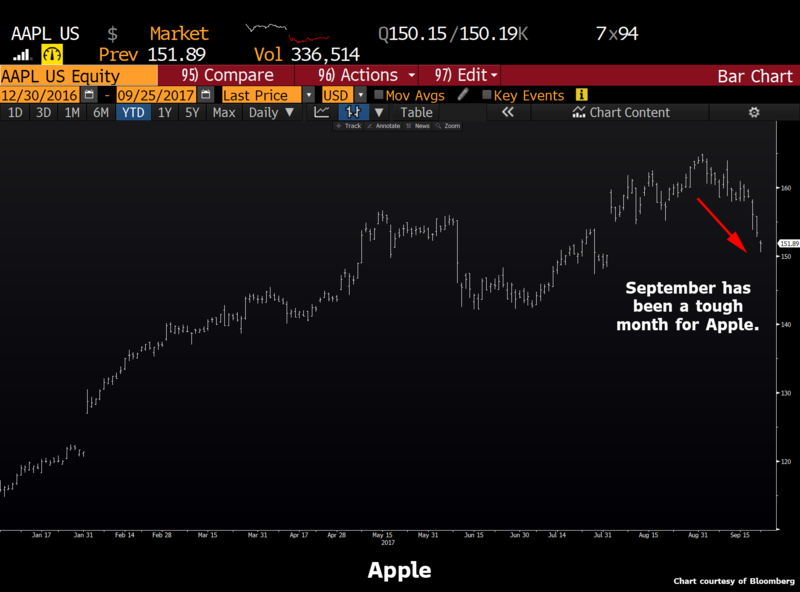 Now some of you will look at the last couple weeks of Apple stock weakness and claim the bad news is already discounted. But I don’t think it is too late to sell. Not by a long stretch. I know Apple is cheap on a fundamental basis. I know Buffett owns it, and has “never sold a single share of Apple.” Yeah, the PEG ratio is low, but when you reach Apple’s size, it’s difficult to justify a big multiple based on continuing growth. Eventually, you hit a point where growth becomes increasingly difficult. And I think Apple has reached that point. Yet it’s not just Apple that worries me. Check out this headline. I realize that eventually even Mark Zuckerberg needs to eat the marshmallow, but let’s not kid ourselves - Zuck is not selling because he needs the money. There have been a handful of hot tech stocks that have driven this rally of the past few years. 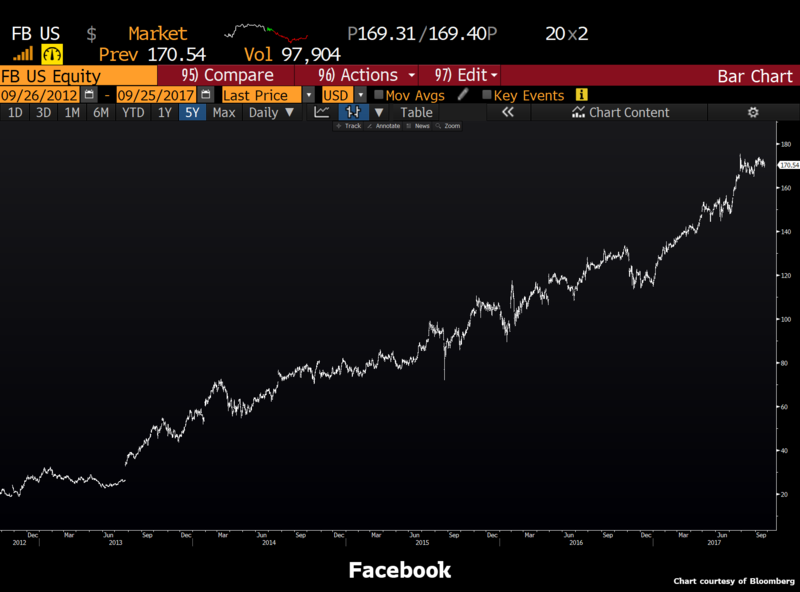 The so-called FANG group (Facebook, Amazon, Netflix, Google), along with a couple of other cult favourites (Apple and Tesla), have captured almost all of the speculative fervour. Along the way, skeptics have been ignored and bearish arguments have not mattered. Dips have just been buying opportunities, and the Nasdaq has led the stock market rally higher. Yet that is slowly shifting. During the last couple of weeks I have noticed that often Nasdaq underperforms the broad market, and it looks more tired than Lindsay Lohan’s probation officer. Over the weekend, L2 Professor Scott Galloway wrote a must-read piece about the potential inflection point for these tech darlings. Take the time to read it - “No Mercy / No Malice: The Worm Has Turned“. These stocks are a potential disaster in the making. They are over-extended, behaving poorly, have insiders pitching stock, and most importantly, smart, big picture thinkers are for the first time questioning their business models all the while, shrewd, market savvy veterans are leaning on the sell button. Many a pundit have made fools of themselves calling for the top in the stock market, but I think we are at an important point for the FANG + APPL and TSLA stock crowd. I am by no means a perma-bear, and have at times even reluctantly joined on the bull side. Yet I can’t help but get the feeling that we are close to the point where all the good news for these tech favourites is baked-in. 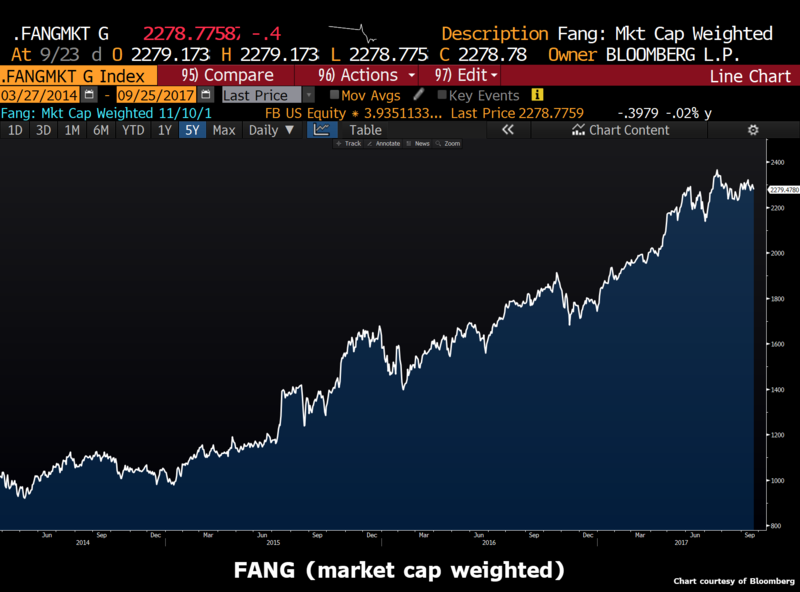 Don’t believe me that investors might be a little over confident about FANG’s continuing dominance? 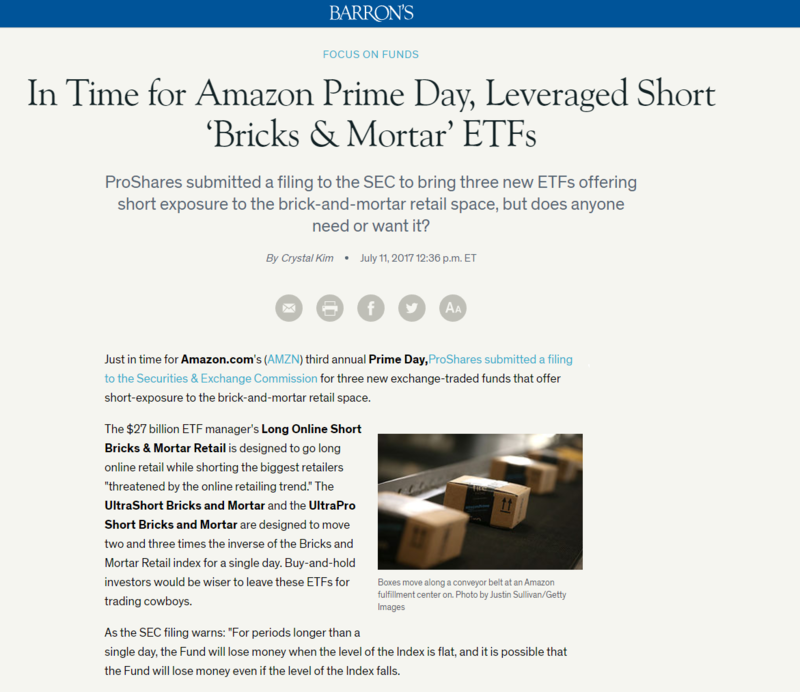 How about this new ETF? 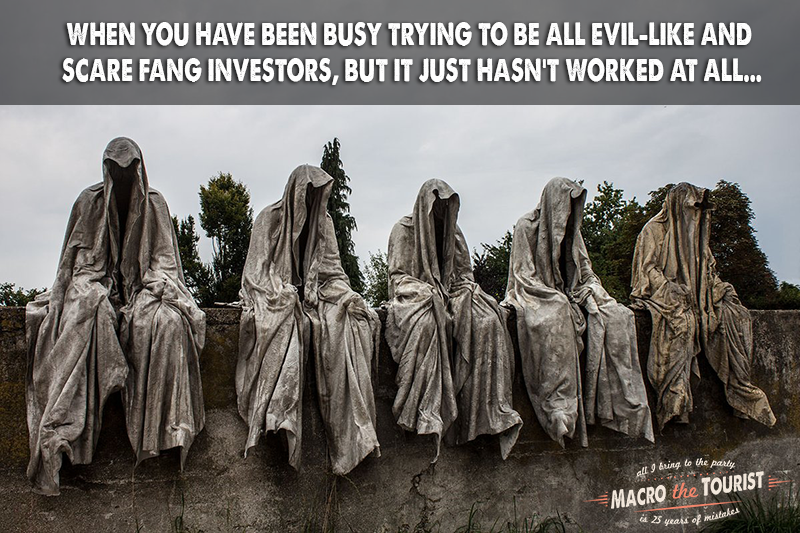 When they start making levered ETFs that go long one of the FANG stocks (Amazon), while simultaneously shorting its competitors, you know you have reached the point in the party where it is time to look for the door before the cops show up. I don’t know how I am going to express this view. Maybe I will shift some of my hedges into Nasdaq put spreads. Maybe I will sell Nasdaq futures against a long position in the S&P’s. Maybe I will just short the FANG basket. I just know the time where I want to be long these trendy stocks is long past, and for the bold, writing some short sell tickets is probably the right trade. 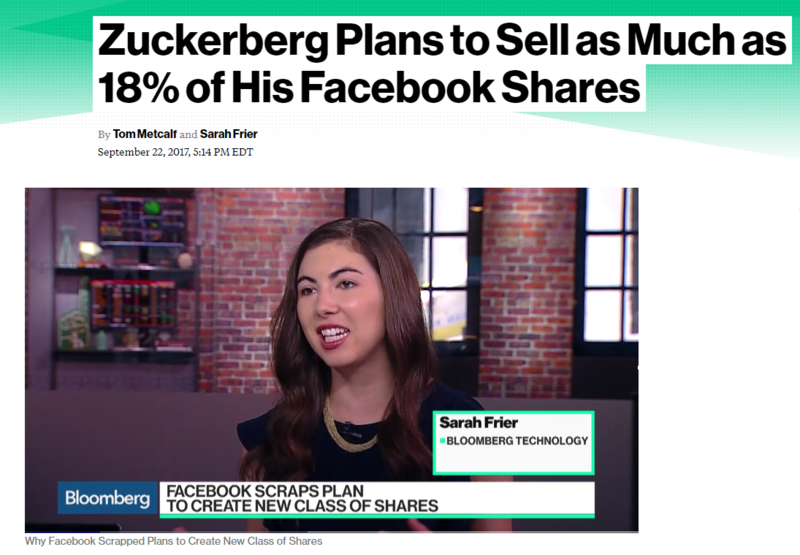 After all, even Zuckerberg has finally hit the sell button, and according to all the millennials I know, that guy is a genius. PARIS (Reuters) - A large part of Louis Dreyfus Company’s European grains trading team, including Global Head of Grains David Ohayon, has left the company, trade sources said on Tuesday. No one was available at Dreyfus for comment. Several sources also said Cesar Soares, Regional Head of Grains for Europe and Black Sea, and senior trader Pascal Durouchoux had left. Dreyfus is part of the so-called ABCD quartet of global agricultural traders along with Archer Daniels Midland, Bunge and Cargill [CAR.UL], which have been restructuring in response to falling profits. In the summer of 1987, Salomon Brothers closed their entire money market division because of lack of profits - after all why bother trading T-bills when stocks were flying? A few months later, the equity crash hit, and money markets went bizerk. Time and time again, the closing of desks, or the leaving of entire teams, signaled a secular low in that asset class. You can probably see where I am going with this. The trouble is, you have heard me make this argument before. And let’s be honest, grains are not my friend. In the epic Scorsese film, Casino, Sharon Stone’s character, Ginger, keeps going back to her deadbeat boyfriend, Lester Diamond (played by James Woods), no matter how well she is treated by her husband Sam Rothstein (Robert De Niro). Sam showers her with everything she has ever wanted, diamonds, furs, cars, but it doesn’t matter. Ginger can’t help but return to the loser boyfriend. 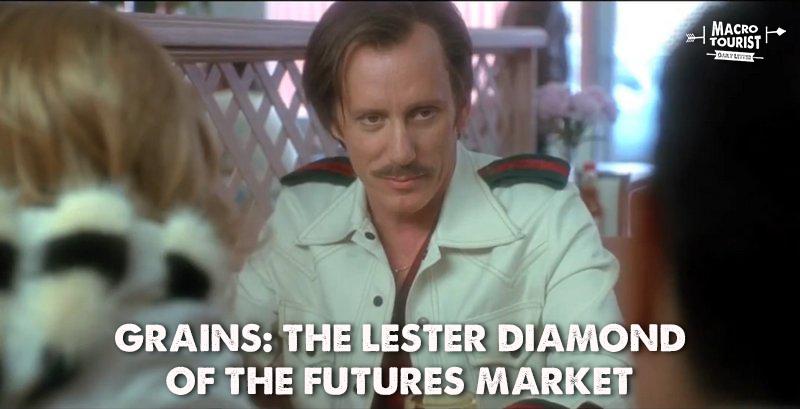 Well, grains are my Lester Diamond. No matter how much pain they bring me, I come back like a lost puppy. Now sometimes I managed to squeak out a little win, catching a reluctant fleeting rally. But grains always end up betraying me. Although I love to remind everyone of Don Coxe’s famous line, “the best bull markets occur when those that know it best, love it least, because they have been burned the worst, I am approaching the point where I am wondering if I should continue picking up Lester’s phone call. After all, don’t the other markets treat me fine? Shouldn’t I be happy putting grains in the rearview mirror? 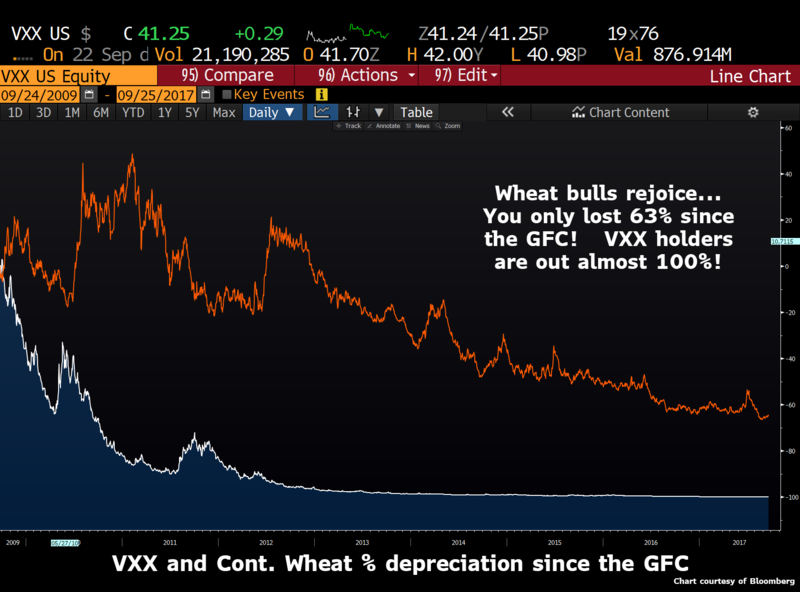 I have been fortunate to avoid one of the post-GFC’s (Great Financial Crisis) greatest destroyers of wealth - the VXX long trade, but I have replaced it with my own relentless bleeding asset - wheat, and the other grains. Now before you get too despondent about wheat’s performance, this chart is somewhat misleading. 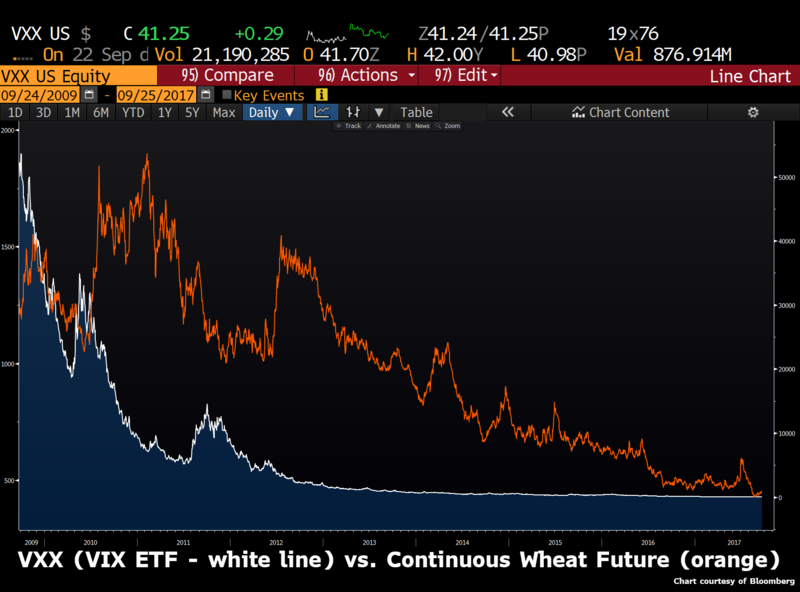 On a relative basis to VXX, wheat is an all-star. Since the GFC, holding a straight long position in VXX has cost you almost 100%. Wheat, on the other hand, has lost you only 63%. All kidding aside, grains are my nemesis, and I understand if you ignore my ramblings on the subject. My much-hoped-for secular turn is nowhere to be found, and timing on any blue tickets has had to be near perfect to make any money. But I refuse to give up on grains. I still believe it to be one of the last true remaining “cheap” assets. And like an idiot, I am going to tell you why I am buying them again. 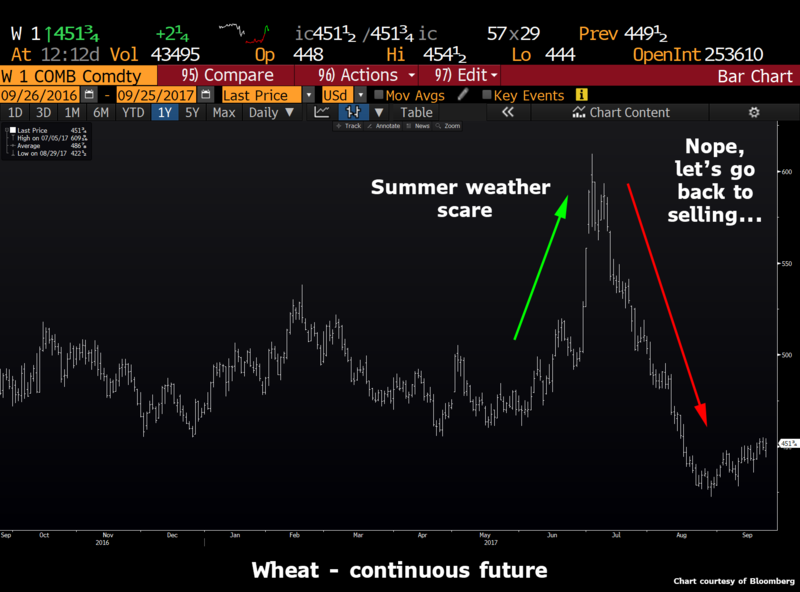 This summer we had a little bit of a weather scare, but it lasted for about two weeks before the relentless grain selling returned. Once again we had a great growing season, and according to the USDA, yields are terrific. The trouble is that many farmers don’t believe the reports, and have been waiting to hedge their crops. So every tiny bit of a rally has been met with a barrage of selling from offside producers. And that’s why we have melted lower. The information contained in this website is of a general nature and is for informational purposes only and does not constitute financial, investment, tax or legal advice. These materials reflect the opinion of The Macro Tourist on the date of production and are subject to change at any time without notice due to various factors, including changing market conditions or tax laws. Where data is presented that is prepared by third parties, such information will be cited, and these sources have been deemed to be reliable. Any links to third party websites are offered only for use at your own discretion. Effort has been made to identify potential copyright holders of images used on this website, where appropriate. We are of the belief that certain images on this site may not be protected by copyright and believe these images may be part of the public domain. Please notify the web master if you own the rights to any of the images herein. The Macro Tourist is separate and unaffiliated from any third party listed herein and is not responsible for their products, services, policies or content of their website. All investments are subject to varying degrees of risk, and there can be no assurance that the future performance of any specific investment or investment strategy referenced directly or indirectly in this website will be profitable, perform equally to any corresponding indicated historical performance level(s), or be suitable for your portfolio. Past performance is not an indicator of future results. The data and information on this site is not intended to be an offer to sell nor a solicitation of an offer to buy any securities. Any offering is made only pursuant to the relevant offering memorandum or similar disclosure document, which should be read in its entirety. These contents are intended for a Canadian audience. The Macro Tourist is a service provided by East West Investment Management Corporation.